And they shall be answered. Design and Marketing is our bailiwick. Having developed our tech skills and experience in the real world, we've a mighty keen sense of what grabs. What sells. And what can help you seal the deal. Let us direct your attention to our experience and dedication to both quality and deadlines when it comes to direct mail. Modern Methods is your best resource for getting your message delivered. 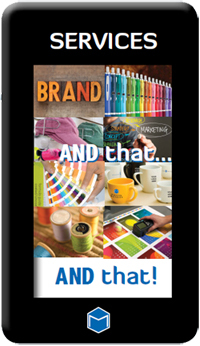 Go ahead: Challenge us to find the perfect promotional item that sends a message. Makes an impact. We'll reach into our bag of 800,000+ products and emerge with just the right thingy to enhance your image and keep you front and center in your customers' minds. Who are you wearing? How about the name of your business. School. Or promotional event. Tastefully emblazoned on clothing and accessories by the hottest names in business, casual and activewear. Clothing only site with clothing, caps / hats, tees, polo's, jackets and bags that can be embroidered or screen printed. Everything needed for Trade Show Displays. Booths, Retractable Banners, Table Throws/Covers, Table Top Displays, Flags and Signs. All types of Pocket Folders, Binders, Tabs and Packaging for Marketing.